Want to discover beautiful contemporary kitchen ideas to inspire your new kitchen design? You’ve come to the right place. You can discover millions of contemporary kitchen designs and ideas; from kitchen islands and storage units, to all sorts of kitchen lighting ideas, such as pendant lighting or under cabinet lighting. 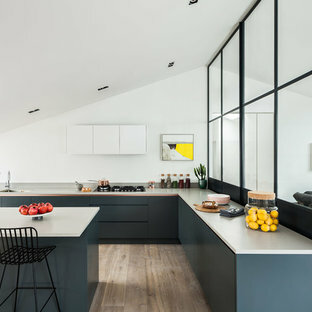 Whether you want inspiration for all-in-one fitted kitchen designs, some small kitchen ideas or maybe just some tips for improving your kitchen decor, there are tons of contemporary photos to inspire you for your next kitchen project on Houzz. What kind of contemporary kitchen design should I go for? With so many kitchen ideas and photos to look at you might be a bit overwhelmed when it comes to picking your own contemporary kitchen design. If you are updating your kitchen you know what a big and important decision it is to get the design right – the kitchen can be the hub and heart of the home, and it’s unlikely that you would invest in renovating your kitchen again in a few years. But fear not, focusing first on the important elements like layout, cabinet style, worktops and appliances will help you to bring together your dream kitchen design. Additional elements like kitchen lighting, cupboard storage and decor can come after in the kitchen planning process. A kitchen designer or fitter can help you to decide the layout of your contemporary kitchen in terms of where to place your kitchen units, appliances and island (if you’re having one), but if you prefer to handle this yourself you can focus on where you want your key elements of your kitchen to be – the oven, hob, sink and fridge. Of course you might be constricted by space, but try to envisage the easiest and most efficient layout based on how you usually like to cook and prepare your food. If you’re fed up of always having to carry dirty pans and pots across the room to the sink, place the sink closer to your oven and hob. Once you have the core elements sorted, consider extra layout considerations, such as where your bins will be stored, where the cutlery draw should be and where small contemporary kitchen appliances can be installed. Should I include a kitchen island? Kitchen island ideas are abundant these days; it seems most kitchen designs include a kitchen island, if not multiple islands. However, if the layout doesn’t work, especially if you have a small kitchen, then there’s no necessity to add in a kitchen island. You can add a breakfast bar or counter to your existing kitchen units, or stick with a good old-fashioned dining table if you don’t need the extra work surfaces. That said, if you do have the room, take a look at some contemporary kitchen island ideas to see if the designs inspire you for your kitchen. 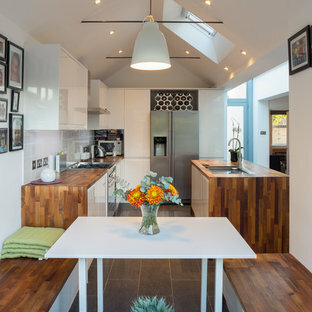 There are a huge variety of island designs to cater to different needs – you can have sinks, ovens, hobs, wine storage and all sorts of drawers and organisers built-in, you can have separate bars and counters that extend from your island, or you could go for a kitchen island on wheels to make your kitchen layout more versatile. What contemporary kitchen storage ideas should I consider? If you want to keep your contemporary kitchen well-stocked and well-equipped but don’t want it spilling over with clutter, then you’ll need to rely on good kitchen storage. Apart from the usual fitted kitchen cupboards and drawer space, there are many other ways of keeping your kitchen tidy. Whilst a large kitchen pantry is the dream of most homeowners, it can’t always be a reality. However, there are now lots of pull out compartments and drawers with trays and shelving that can act as mini kitchen pantries, and you can install handy cupboard organisers that fit onto the inside of the door to make the most of your cupboard space. You can also look at corner drawers and cupboards that open up to reveal lots of extra storage. Rails or small shelves along your kitchen walls or splashback can help with hanging utensils or pans, or storing small items like herbs and spices in an usually empty space. Are there small kitchen ideas for small contemporary spaces? 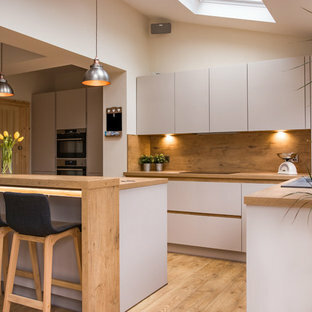 If you’re working with a galley kitchen, a one-wall kitchen in an open plan space or just a pretty small kitchen, there are some small kitchen ideas that can help you get the most out of your cooking and dining area. If you find that you don’t utilise the back of your cupboards (maybe they become the graveyard for out-of-date tin cans), you could decide to go with shallower kitchen units to free up some extra floor space in front of your cabinets. As mentioned, open shelving or glass-fronted cabinets are a popular trend and they should make the space feel more open and less boxed-in. However, if you have the capacity for it, cupboards and contemporary kitchen units that maximise the floor-to-ceiling space you have will mean you can use all of that for valuable kitchen storage. Wall or ceiling racks could be a useful solution for hanging pans and pots if you’ve run out of cupboards in which to store them. Kitchen ideas and contemporary accessories such as baskets, trolleys and storage jars are both aesthetically pleasing and practical as they give you extra storage space. Kitchen appliances like a fridge or dishwasher can be tucked away in built-in units in fitted kitchens so they blend into your layout and don’t make the space look crowded. Discover all the small kitchen ideas you could need by taking a look at photos of compact kitchens. What sort of contemporary kitchen lighting should I go for? In the kitchen you need to have practical lighting – no one wants to chop, cut and cook in a dingy room. Kitchen ceiling lights are probably the best way to go, but should you opt for recessed spotlights or traditional hanging ceiling lights? While spotlight LED kitchen lighting will give you excellent light, they may not fit with a design that’s not contemporary. Traditional chandelier lights could work for other kitchen styles, and of course, kitchen pendant lighting comes in all sorts of styles, colours and designs. 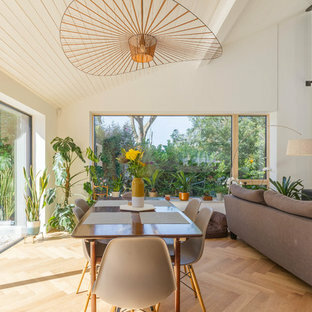 While the popular choice is to go with one or two pendant lights over your kitchen island, you could also opt for a single pendant light over your dining space, or a few spaced out across your kitchen. Of course, if you want good lighting for your worktops, under-cabinet lighting is the way forward. Speak to your kitchen supplier about having this pre-installed, or there are a number of easy-install options you can fit yourself or with the help of a lighting expert or electrician. In the market for your contemporary kitchen lighting today? Once you’ve found some inspiring kitchen lighting ideas here, take a look at our kitchen lighting products to find the new lights for your kitchen project. 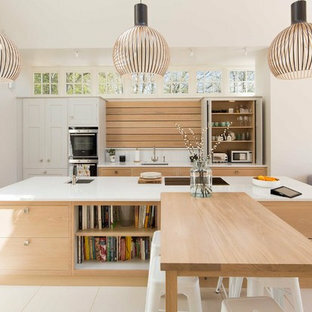 Contemporary galley open plan kitchen in Oxfordshire with a submerged sink, flat-panel cabinets, light wood cabinets, stainless steel appliances and an island. Design ideas for a contemporary open plan kitchen in Other with light hardwood flooring and beige floors. This is an example of a contemporary kitchen in London. A LOOKBOOK selection of B+P products being used within luxury properties. Each property has been designed by B+P’s designer and founder Massimo Minale, an architect by trade alongside our in-house team of interior designers. 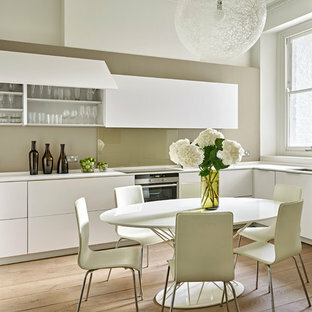 Photo of a contemporary kitchen in London with flat-panel cabinets, white cabinets, white splashback, metro tiled splashback, an island and white floors. This is an example of a large contemporary single-wall kitchen/diner in Devon with a submerged sink, flat-panel cabinets, white cabinets, grey splashback, glass sheet splashback, black appliances, light hardwood flooring, an island, beige floors, beige worktops and quartz worktops. 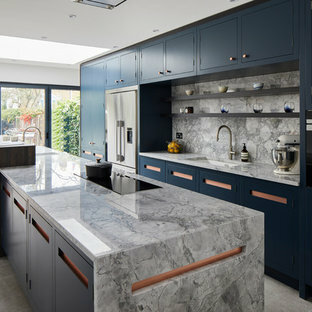 This is an example of a medium sized contemporary l-shaped open plan kitchen in London with a double-bowl sink, flat-panel cabinets, blue cabinets, concrete worktops, an island and brown floors. Design ideas for a medium sized contemporary l-shaped kitchen/diner in London with a single-bowl sink, flat-panel cabinets, white cabinets, composite countertops, glass sheet splashback, stainless steel appliances, medium hardwood flooring and no island. 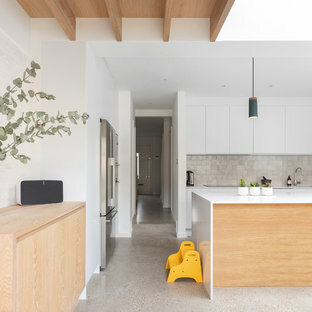 Photo of a medium sized contemporary l-shaped kitchen in Other with flat-panel cabinets, grey cabinets, wood worktops, beige splashback, wood splashback, stainless steel appliances, light hardwood flooring, an island, brown floors and beige worktops. 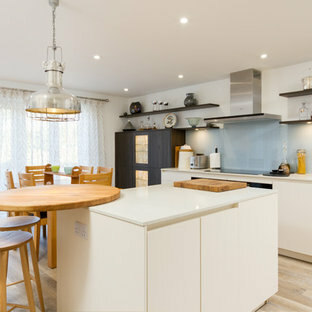 This is an example of a small contemporary u-shaped kitchen/diner in Hertfordshire with a double-bowl sink, wood worktops, white splashback, ceramic splashback, stainless steel appliances, ceramic flooring, grey floors, brown worktops, flat-panel cabinets, white cabinets and no island. Kitchen Architecture – bulthaup b3 furniture in alpine white and clay laminate with glass wall panels and stone work surfaces with a walnut bar. This is an example of a contemporary single-wall kitchen in London with flat-panel cabinets, white cabinets, white splashback, stainless steel appliances, light hardwood flooring and an island. The Brief - To design a highly functional kitchen/dining space incorporating sleek hi-tech appliances combined with sophisticated, clean lines and attention to detail. Style - Industrial Sleek By day, natural light floods through the glass partition from the living room highlighting all the surface textures, ensuring the space is bright and airy despite the dark coloured work surfaces and flooring. By night, the space is transformed into an elegant dining space with multi layered soft lighting, creating a sophisticated air. Inspiration for a medium sized contemporary kitchen in London with flat-panel cabinets, white cabinets, an island, a single-bowl sink, metallic splashback, light hardwood flooring and beige floors. 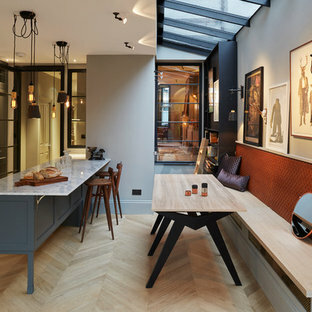 Photo of a contemporary kitchen in London. 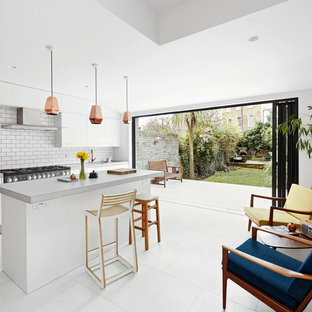 Photo of a medium sized contemporary l-shaped kitchen in London with a double-bowl sink, flat-panel cabinets, grey cabinets, stainless steel appliances, marble flooring, an island and white floors. Contemporary Kitchen Design with Siemens appliances, Handleless Kitchen Furniture and Glass splashback. This is an example of a contemporary single-wall kitchen in London with a built-in sink, flat-panel cabinets, white cabinets, white splashback, glass sheet splashback, black appliances, light hardwood flooring, no island, beige floors and grey worktops. Pronorm Y Line Matt laminate handle less light grey kitchen. This kitchen features Rift Oak breakfast bar, soft close doors, white Quartz worktop, Neff ovens and blue glass splashback.